When it has been a successful year for your business, many times, as a business owner, you look for ways to reinvest your profits back into your business. When you have the right team, up-to-date production equipment, and a great service to your consumers – finding ways to improve the process may be challenging. This is when many companies start to look at ways to improve the process and workflow of their operations to optimize their efforts. 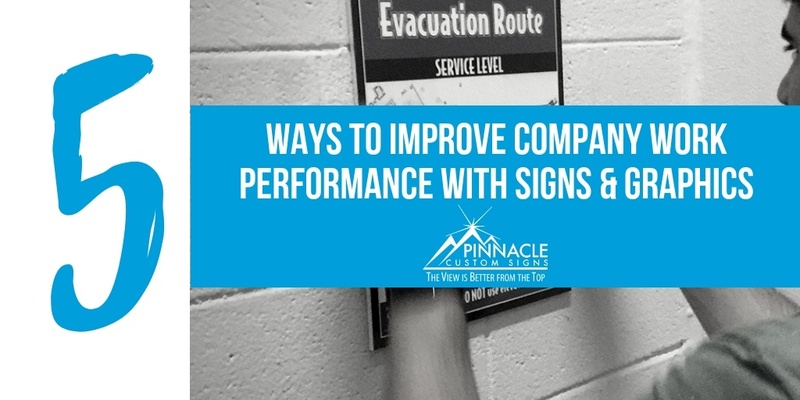 One way to improve the overall flow of the company’s efforts can be through improving your signs and graphics to create a better environment. Make sure that employees and guests can easily find where they are going when they need to be there. This type of signage helps to point people in the right direction and make sure that things are flowing smoothly. Use these types of signs or graphics to ensure that your team knows about import dates or project specifications. This type of signage can also share company policies and protocols in central workspaces. 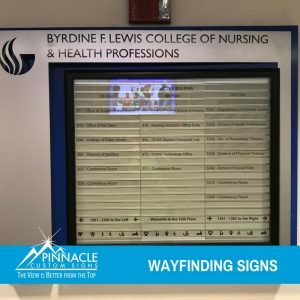 These types of signs help to visually organize your office space for those who are not familiar or need assistance in understanding specific areas. 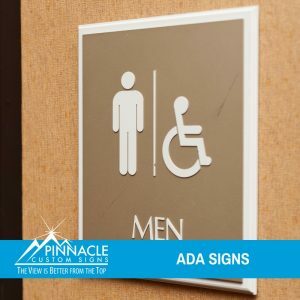 Making sure that visitors can easily identify areas that are off limits or something as simple as available restroom facilities can be vital to improving communication and satisfaction. Creating collaboration spaces can help to integrate different departments and improve your team’s culture. Sometimes increase productivity can come down to increasing interdepartmental communication. Using signs and graphics to quickly and easily identify hazardous materials and restricted areas with various types of graphics can help encourage your company safety program and prevent injury. 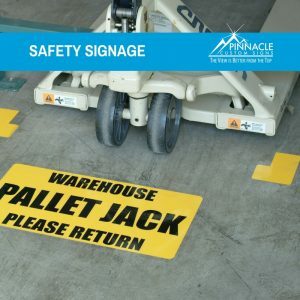 From using wall signage to incorporating new decals to mark equipment and storage, taking the next step in your safety signage can save you money in the long term. Start by assessing your current environment and ask questions. There are various ways to invest in signs and graphics to improve the quality of your work production. One of the best ways to start an assessment is to talk to your team, ask questions of your visitors, and listen to the comments of those who aren’t walking the halls each day. Are the bathrooms clearly labeled? Do people often park or deliver packages in the wrong place? Do we have any doors that aren’t accessible to the public? Do people get lost in our office space? Do we have areas that are off limits? Do we house any hazardous material? Does our staff congregate in certain areas? How can we increase communication and collaboration? What things do our staff need to be reminded of often? By using these suggestions as a starting point for conversation, your staff is sure to brainstorm ideas on how to improve upon operations from one fiscal year to the next. Creating a branded internal communication plan is a great first step in improving small things around the office space. For some business models and locations, this exercise can seem overwhelming. Pinnacle is here to help guide you to keep the process direct and productive. We have experience with onsite visits to provide an outside perspective on ways to invest the right funds within your budget to improve your business. Give us a call or reach out to us for further information.